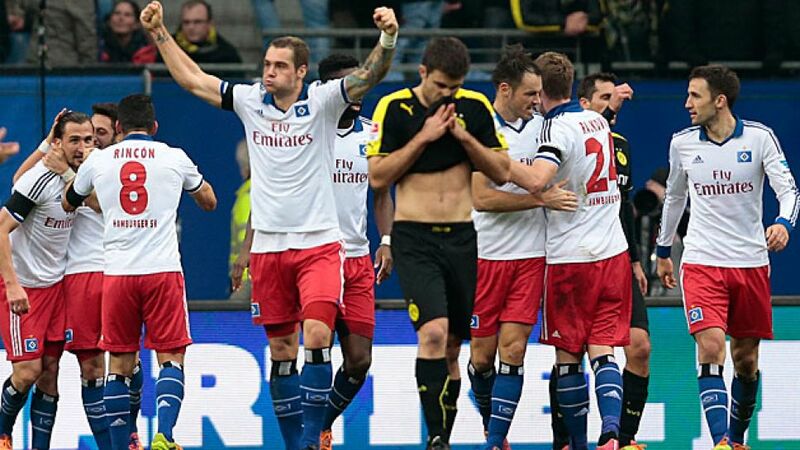 Hamburg - Hamburger SV finally ended their seven-game losing streak, celebrating a 3-0 victory over Borussia Dortmund to mark Mirko Slomka's first game in charge of the north German club. Petr Jiracek gave a transformed Hamburg side the lead before half time, with Pierre-Michel Lasogga adding a second before the hour mark. A memorable long-range effort from Hakan Calhanoglu completed the victory in stoppage time as HSV responded to the change in coach in sensational style. Slomka only took over last Sunday, but in five days of training he had clearly seen enough to convince him changes were necessary, making six alterations to the side which started last weekend's 4-2 defeat to Eintracht Braunschweig. Perhaps more importantly, it also seemed like he had changed the players' mentality, as they shook off the fear which had shackled them in recent matches. A Jiracek shot tested Roman Weidenfeller early on, and the Dortmund custodian was to be far the busier of the two goalkeepers. Milan Badelj also tested Weidenfeller from outside the penalty area, before the offside flag denied Robert Lewandowski the chance to give Dortmund the lead against the run of play. Lasogga embodied Hamburg's newfound belief by refusing to give up what seemed like a lost cause when a cross was deflected into the penalty area. He held off his marker and scooped the ball into the centre from the goal line to the far post where Jiracek beat Pierre-Emerick Aubameyang to the ball to head Hamburg in front. Dortmund coach Jürgen Klopp sent Marco Reus on for Sven Bender at the start of the second half, but not even that was enough to match Hamburg. The Red Shorts grabbed a second goal when Calhanoglu sent Lasogga clear, and the on-loan Hertha Berlin striker kept his cool to slot past Weidenfeller and raise the decibels even further inside the Imtech Arena. It was almost three when Johan Djourou headed in from a corner, but play had already been stopped for a push inside the penalty area. Aware that Hamburg were not going to crumble as they had in their last seven Bundesliga matches, and with one eye on Tuesday's UEFA Champions League tie with Zenit St Petersburg, Klopp hoisted the white flag with 25 minutes still to play. Robert Lewandowski was hauled off for a rest with Marvin Duksch sent on, and he nearly steered the Westphalians back into the game with a volley which Rene Adler parried. It was all in vain, though, as Calhanoglu had the final say, sending in a stunning, swerving, direct free-kick from near the centre circle past Weidenfeller to seal a memorable victory.